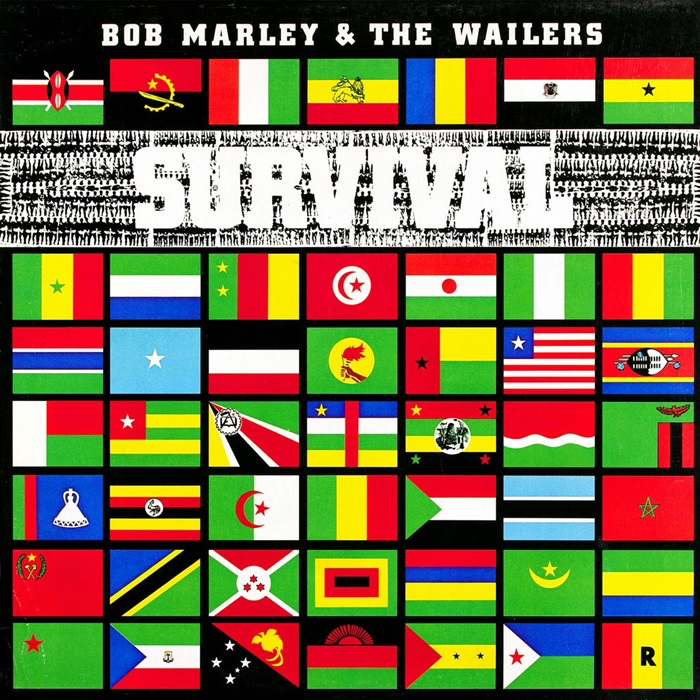 After the laid-back, chilled-out and romantic ambience, both musically and lyrically, of the previous year's "Kaya" album, Bob Marley went back to a more roots approach with this potent, politically-motivated album. After "Kaya" and the blatant commercial feel of much of "Exodus", "Survival" would be Marley's most "roots" and "Conscious" album since 1976's "Rastaman Vibration". "So Much Trouble In The World" is a full, bassy mid-paced song reminiscent of the early 1971-72 "Soul Rebel" days, but with a soulful, catchy chorus. The roots on this album is dished up with a sensitive ear for a killer hook. The same applies to "Zimbabwe", a solid, grinding number with another fine hook. Blatantly political in its concerns about the former Rhodesia, it finds Marley taking on global issues as opposed to those of his own backyard, which is a notable shift in emphasis. He is now finding he has responsibilities to sing and speak for the wider "bredren", not just the Jamaican, or the Rasta. This is is further evinced by the multiple flags of African/ethnically black nations on the cover. "Top Rankin'", though, returns to Jamaican political turmoil with a melodic skank, lots of backing vocals, horns and a lilting aah-wah guitar. A bit like some of the rootsier material on "Exodus". There were, however, far more "black consciousness" themes on this album than "Rasta devotional" ones. The old Rasta chanting rhythms are back for "Babylon System" - thumping, heavy drum sounds, female backing vocals and a "call to arms" chant-inflected vocal over the strong, slow and solid beat. an intoxicating number. 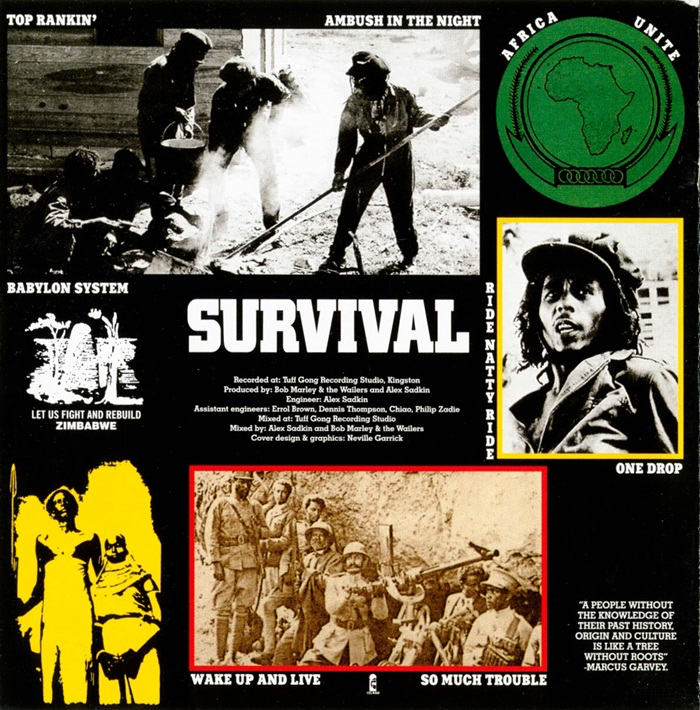 "Survival" is a tuneful, upbeat black consciousness track in the vein of "Exodus" (particularly in the vocal stylings) that sees the black diaspora as "black survivors" on a seemingly never-ending, tortuous journey. Another song with an irresistible hook. 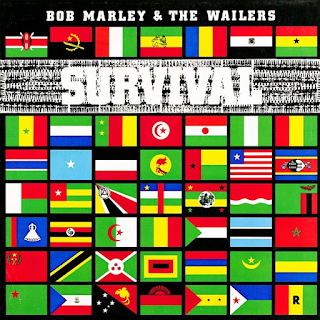 The catchy hook (again) of "Africa Unite" has Marley addressing the African continent again, using a plaintive, "Kaya" style vocal, while the likeable, rhythmic "One Drop", with its unique drum sound, would have made a good single. It is my favourite track on the album. Marley's vocal on this is both sad and uplifting at the same time. "Ride Natty Ride" is a horn riff-driven laid back, bassy groove that is extremely alluring. Bob's understated, quiet vocal is almost drowned out by the vigour of the I-Threes, but to good effect. Bob is playing the quiet, wise Rasta here. I love this one too. Yet again, a drop dead hook and overall rhythmic appeal. While I like "Kaya" as an album, there is so much more punch, attack and mission on this album. "Natty Dread rise again..." Indeed. Again, there is a sadness to Bob's vocal delivery, however. "Ambush In The Night" is a heavy, roots song relating to his experience with an armed intruder that almost cost him his live. There is a heavy clavinet driving the song along and again, although it has a deep roots groove, there is an easily identifiable chorus part. Some nice wah-wah guitar on it as well. Strong, vibrant kicking horns introduce the exhortation to "Wake Up And Live", which also has vibes of the track "Exodus", even more so than "Survival" - an insistent, urgent beat, prominent I-Threes backing vocals, some excellent horn solo pieces and a general anthemic, rousing feel to end the album on. One of the best tracks from an impressive collection. Whereas the message in "Kaya" had been to take it easy, here it was to get up and stand up once again and make your feelings known. A quality album. No question.